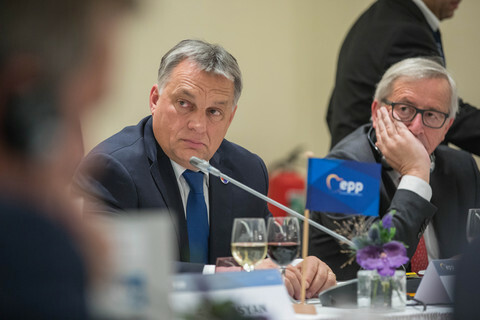 Europe will, this year, face even more problems, but the idea the EU is over isn’t true, European Commission chief Jean-Claude Juncker has said. “I don't have too many illusions about the year ahead. Because everything is going to be difficult,” he told press in Brussels on Friday (15 January). “The number of unresolved problems has been piling up. I'm sure problems will be added to the list,” he added, giving as an example “the issue of the UK”. The Luxembourg politician spoke for one hour and nine minutes. He made fewer jokes than usual and expressed annoyance at being photographed. But despite his sometimes grumpy tone, he said the problems can be solved. "I'm not going to give up. I reject the idea that this is somehow the beginning of the end,” Juncker said. The idea is in the air due to the refugee crisis, which has prompted several EU states to reimpose border checks in the Schengen free-travel area. Juncker echoed remarks made earlier this week by German chancellor Angela Merkel, who said Schengen underpins the EU project. “Without the freedom of European citizens to travel, the euro makes no sense,” Juncker said. He added that post-Schengen border checks would also cost EU states €3 billion. Juncker alluded to the fact eastern EU states are reluctant to implement his refugee-sharing scheme. “The commission has done everything that could possibly have been done … but a number of member states find it difficult apparently to implement decisions which they took themselves in the various councils of ministers,” he said. 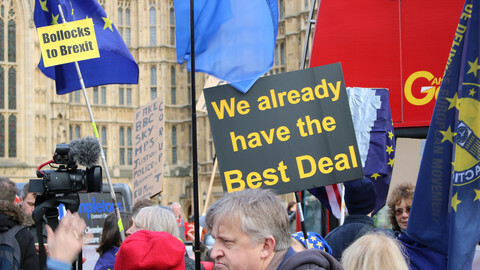 On the UK, which wants to renegotiate its relations with the bloc, prior to an In/Out referendum, Juncker said talks “are entering a delicate period”. “I'm not optimistic, not pessimistic. I'm quite sure we'll have a deal. Not a compromise, [but] a solution, a permanent solution … in February,” he said. He spoke after the EU launched a probe into Polish constitutional and media reforms, which, critics say, undermine judicial oversight and free speech. 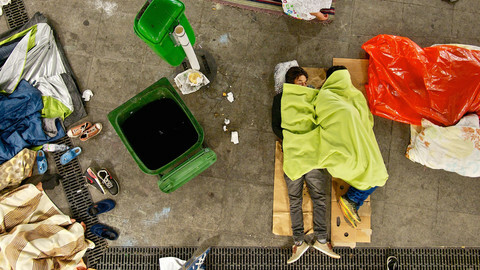 “I must confess the current debate in Europe makes me sad. The commission doesn't have a problem with Poland. We have a problem with certain initiatives from the new Polish government,” Juncker said. 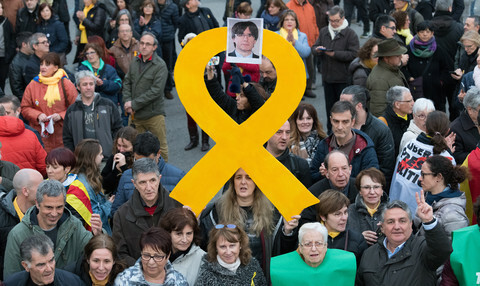 He criticised people who keep mentioning “article 7,” the EU’s so-called nuclear option, which involves suspension of Council voting rights, because it’s too remote a possibility. It “doesn't make sense” because the commission and Poland are in “dialogue,” he noted. The commission chief also spoke out on Italian leader Matteo Renzi, who has hit out at Brussels on a range of issues, from austerity to the alleged mistreatment of an Italian member of Juncker’s private office. Juncker said Renzi “demonises” the commission. 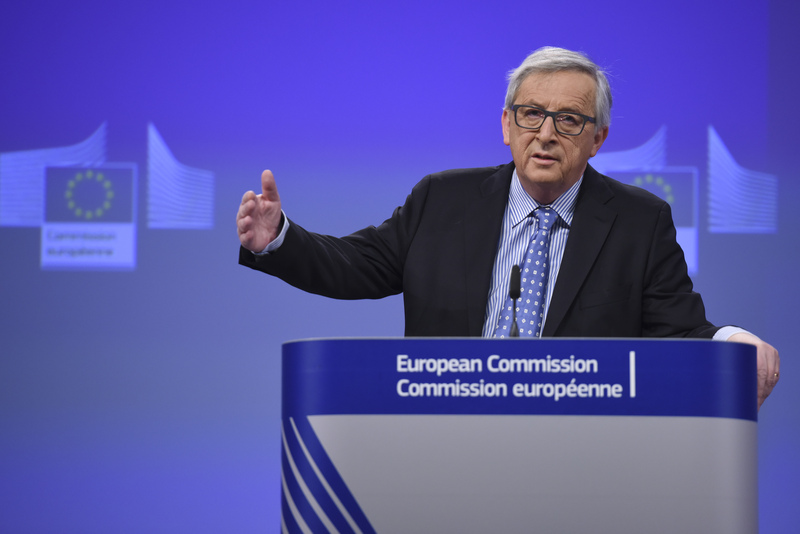 “You know that I have the greatest respect and indeed love for the Italian PM … I don't really know why he does this,” Juncker noted, hinting at domestic political motives. There was one optimistic note on a long-standing issue: the more than 40-year old frozen conflict between Cyprus and Turkey. "I'm very confident that in the first six months of this year we will come to a final agreement on the reunification of that island," Juncker said. The accord could unlock Turkey's EU membership talks and improve Turkey-EU cooperation on migrants. 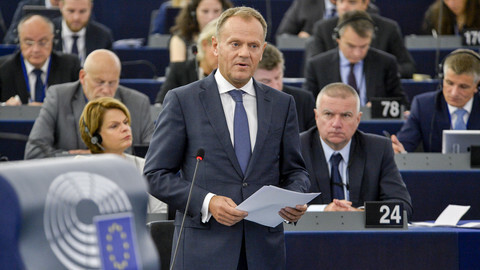 The EU Commission president is to present and debate his policies in the Parliament almost a year after taking office. Polish PM Beata Szydlo has said EU monitoring won’t lead to sanctions, while again bashing Dutch commissioner Frans Timmermans. Three out of 11 hotspots in place. Two hundred and seventy people out of 160,000 relocated: Last year's EU promises to limit and better manage migration flows yet to materialise. 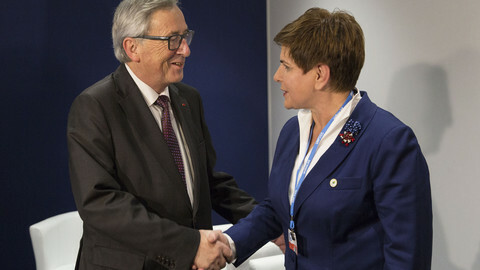 EU commission chief Juncker and Polish PM Szydlo held a 45-minute phone call ahead of a commissioners' meeting to discuss controversial new laws in Poland. The EU Council president has warned that the March summit "will be the last moment to see if our strategy works". He also said he would soon "table a concrete proposal" for a deal with the UK.